“Jesus told his disciples a parable about the necessity for them to pray always without becoming weary” (from Luke 18:1-8). 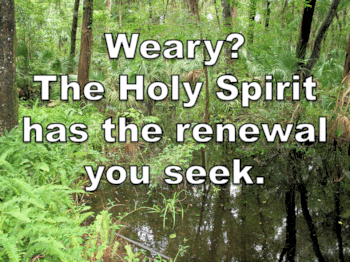 What do you do to overcome weariness in prayer? When you you don’t see results from your prayers, what do you do to become aware that God still cares, that he is a working a good plan, and that he is not ignoring you? What do you do that allows God to refresh you and re-energize your faith? For me, going to daily Mass is very restorative. 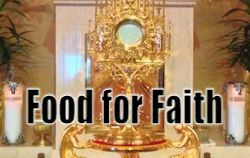 So does sitting quietly in front of Jesus in Eucharistic Adoration. Or going to a peaceful park to slow down and let the Holy Spirit speak to me — which is why I turned my favorite restorative park into a Virtual Reality Retreat space (Restful Water Way) so that others may experience this when they cannot get out to a real park. But what renews my faith energy most is being with other faith-filled Christians who are celebrating — and I mean, really CELEBRATING! — the goodness of God. This can be found in lively, healthy prayer groups of the Catholic Charismatic Renewal. The problem is, there’s not one near me that I can join (at the time of this writing). Recently, I cried out to the Lord: “I’m so weary! I need a Spirit-filled retreat!” Jesus put the thought into my head: “Go online to find out when the Orlando conference will be” (about an hour and a half from my house). Lo and behold, it was just two weeks away! While Ralph and I were driving to Orlando, a friend who was praying for my weekend of renewal told me that she would be going to one in Atlanta (Georgia) in November, and she said I should go there, too. I thought, “No, it’s not practical, especially so soon after the Orlando conference.” However…. “Yes” is a holy word. At the first conference, God began renewing my energy by teaching me to say “yes” to all opportunities that seem good. Then, after we give him our yes, we are to let him decide what to do about it. If the idea was from him, the Holy Spirit will guide us into it and enable us to do it. If the idea was not from him, and if we are listening to the Holy Spirit, nothing will come of our mistaken yes. It’s all good! So, I decided to practice what I was learning, and I said yes to going to Atlanta. But why not take all of Good News Ministries with me? 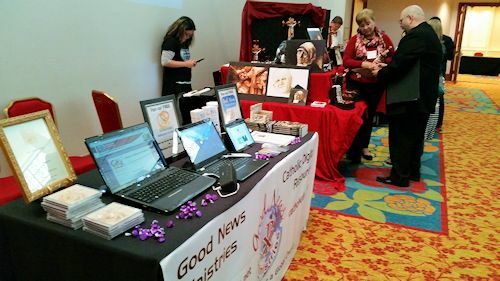 I decided to purchase a booth at the conference to invite more people to discover how God can minister to them through GNM. That conference was powerful and wonderful, healing and freeing. Plus, our booth got a lot of attention. I gave out samples of Sunday’s reflection and used two laptop computers and a tablet to let people explore our websites. Passersby stopped and signed up for the Good News Reflections and Reflections for Couples. One lady was so excited about what we offer for RCIA (at Catholic Digital Resources) that she brought a friend over to see it. Another one lit up with delight because the Reflections for Couples are what her son had been looking for. A conference booth is the type of outreach that gleans new members who otherwise have not yet found us online. Plus, it’s an opportunity for many faith-building conversations. This public relations opportunity was made possible by our evangelization-spirited benefactors who champion the Good News with their support. In other words, our prayer energy is renewed by worshiping with others who are fired up with the lively praise and prayer experiences of the Catholic Charismatic Renewal (and other Spirit-filled, Spirit-fired events) and by saying “yes” the Lord so that he can freely lead us to the restoration we need.